The Western Green Drake, Drunella grandis, is a rock star in the world of aquatic entomology. It’s on the cover of all the magazines, and people travel from across the globe to see the show they put on. In many ways, Green Drakes and the fishing situations that they create in Yellowstone Country represent the pinnacle of our sport. Most fly anglers spend the long winter months dreaming of warm summer days, green meadows filled with wild flowers, and large trout feeding recklessly on a blanket hatch. Green Drakes are the bugs that make those dreams come true for fishermen in our area from mid-June through the end of July. There are actually three other species of mayfly found throughout Yellowstone Country that anglers commonly refer to as Green Drakes. These other species wish they could be as cool as grandis, but like cover bands posing as the original, they look and act like the real thing, and can certainly provide a good time, but just don’t pack quite the same punch. Drunella coloradensis, Drunella doddsi, and Timpanoga hecuba are the Green Drake cover bands, and they all play important roles in Yellowstone Country fisheries. Drunella coloradensis and Drunella doddsi are the smaller cousins to Drunella grandis, and are sometimes confused with their other more widely known cousin Drunella flavilinea. 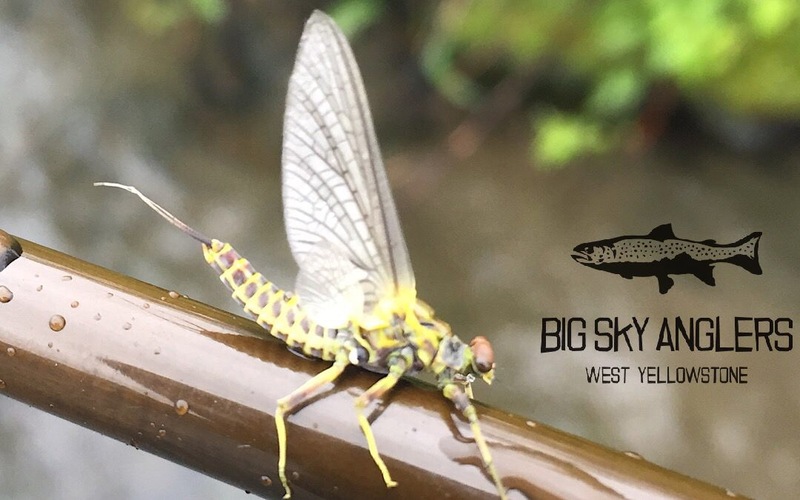 These smaller size 14 drakes are found in rivers and streams throughout the region including the Gallatin, Soda Butte, Lamar, Big Hole, and Madison. Timpanoga hecuba is the heralded fall drake found in the waters of the Northeast corner in Yellowstone Park. Slough Creek, Soda Butte Creek, the Lamar River, and the Yellowstone River all have a good population of this large size 12 mayfly in September and October. Drunella grandis is a formidable animal in our rivers and streams. It is generally the largest mayfly species in the waters that it occupies (size 8-10 nymphs and size 10-12 duns), and it is not always a good neighbor. These stout, three-tailed nymphs cling to rocks and other substrate with strong appendages, and will often prey on smaller nymphs and larvae. The Henry’s Fork has one of the most celebrated Drunella grandis hatches. The flat, spring creek waters of the upper river around Last Chance, and the wide open riffles and weed bed flats of the lower river below Ashton provide ideal habitat for these large, clumsy mayflies. During emergences Nymphs swim slowly to the surface, emerge awkwardly, and typically ride the current for a long time before lumbering into flight. The resident trophy trout couldn’t dream of a more vulnerable target, and they take full advantage. Freshly emerged duns here display a vibrant chartreuse green body with slate dun colored wings, but that coloration soon darkens to an olive-brown. Their wings are large in proportion to the length of their stout body, a feature that many creative fly tiers incorporate into their imitations. The Madison River has one of the more overlooked hatches of Drunella grandis. In early July duns can be found emerging sporadically on sunny days, and in good concentrations on cloudy, rainy days between Hebgen Lake and Ennis. Even a sparse emergence of these trout snacks is often enough to get the fish looking up, so it pays to be aware and on the lookout for these bugs. However, unlike other area fisheries, many days it’s the spinners that can provide the best dry fly fishing on the Madison. These size 12, rusty or chocolate brown colored spinners can be found in good numbers during the morning hours over select riffles. Drunella grandis is also found on many of the smaller tributary waters to our larger, more renowned rivers. It’s always a good idea to have either specific drake imitations, or size 12 attractor patterns like a Humpy or Royal Wulff in your fly arsenal if you’re exploring these smaller waters during late June and July.